Quantum information protocols are commonly based on two kinds of encoding. Some experiments are performed with discrete-variables (DV), where the information is encoded in a finite-dimensional Hilbert space, for instance on the polarization of single photons. Other experiments focus on the continuous-variable (CV) approach, where the information is encoded in an infinite-dimensional Hilbert space, for instance on the quadrature components of light modes. Hybridization of CV and DV photonic technologies enables novel quantum state engineering and processing capabilities. The research includes the realization of hybrid protocols for entanglement characterization, the generation of highly non-gaussian states and hybrid entangled states between particle- and wave-like optical qubits and the use of such resources for networking protocols. Experiments are typically based on optical parametric oscillators (single-mode or two-mode squeezing), photon-number detections based on SNSPDs and homodyning. A video of the lab, with typical procedures explained, is available here. Einstein-Podolsky-Rosen steering is known to be a key resource for one-sided device-independent quantum information protocols. We have demonstrated steering using hybrid entanglement between continuous- and discrete-variable optical qubits. To this end, we derived a suitable steering inequalities and detailed the implementation and requirements for this demonstration. Steering has been experimentally certified by observing a violation by more than 5 standard deviations.This result illustrates the potential of optical hybrid entanglement for applications in heterogeneous quantum networks that would interconnect disparate physical platforms and encodings. Transferring quantum information between distant nodes of a network is a key capability. This transfer can be realized via remote state preparation where two parties share entanglement and the sender has full knowledge of the state to be communicated. Here, we demonstrate such a process between heterogeneous nodes functioning with different information encodings, i.e., particle-like discrete-variable optical qubits and wave-like continuous-variable ones. Using hybrid entanglement of light as a shared resource, we prepare arbitrary coherent-state superpositions controlled by measurements on the distant discrete-encoded node. The remotely prepared states are fully characterized by quantum state tomography, and negative Wigner functions are obtained. This work demonstrates a novel capability to bridge discrete- and continuous-variable platforms. Non-Gaussian states, and specifically the paradigmatic cat state, are well known to be very sensitive to losses. When propagating through damping channels, these states quickly lose their nonclassical features and the associated negative oscillations of their Wigner function. However, by squeezing the superposition states, the decoherence process can be qualitatively changed and substantially slowed down. Here, as a first example, we experimentally observe the reduced decoherence of squeezed optical coherent-state superpositions through a lossy channel. To quantify the robustness of states, we introduce a combination of a decaying value and a rate of decay of the Wigner function negativity. This work, which uses squeezing as an ancillary Gaussian resource, opens new possibilities to protect and manipulate quantum superpositions in phase space. In this work, we report on high-efficiency superconducting nanowire single-photon detectors based on amorphous WSi and optimized at 1064 nm. At an operating temperature of 1.8 K, we demonstrated a 93% system detection efficiency at this wavelength with a dark noise of a few counts per second. As an application, we show the fast heralding of single photons. Combined with cavity-enhanced spontaneous parametric down-conversion, this fiber-coupled detector enabled us to generate narrowband single photons with a heralding efficiency greater than 90% and a spectral brightness as high as 0.6.10^4 photons/(s.mW.MHz). Beyond single-photon generation at large rate, such high-efficiency detectors open the path to efficient multiple-photon heralding and complex quantum state engineering. This work has been led in collaboration with NIST-Boulder and JPL-Nasa. We recently proposed and experimentally realized a novel versatile protocol that allows the quantum state engineering of heralded optical coherent-state superpositions. The scheme relies on a two-mode squeezed state, linear mixing, and a n-photon detection. It is optimally using expensive non-Gaussian resources to build up only the key non-Gaussian part of the targeted state. In the experimental case of a two-photon detection based on high-efficiency superconducting nanowire single-photon detectors, the freely propagating state exhibits a 67% fidelity with a squeezed even coherent-state superposition with a size |α|2=3. The demonstrated procedure and the achieved rate will facilitate the use of such superpositions in subsequent protocols, including fundamental tests and optical hybrid quantum information implementations. This work is based on the collaboration with four other institutions worldwide, including NIST Boulder, JPL-Nasa, Palacky University and ECNU Shanghai. The wave–particle duality of light has led to two different encodings for optical quantum information processing. Several approaches have emerged based either on particle-like discrete-variable states (i.e. finite-dimensional quantum systems) or on wave-like continuous-variable states (i.e. infinite-dimensional systems). In our lab, we generated entanglement between optical qubits of these different types, located at distant places and connected by a lossy channel. Such hybrid entanglement, which is a key resource for a variety of recently proposed schemes, including quantum cryptography and computing, enables information to be converted from one Hilbert space to the other via teleportation and therefore the connection of remote quantum processors based upon different encodings. Beyond its fundamental significance for the exploration of entanglement and its possible instantiations, the realized optical circuit holds promise for implementations of heterogeneous network, where discrete- and continuous-variable operations and techniques can be efficiently combined. We are now developing novel protocols exploiting such hybrid entanglement, in particular hybrid teleportation between CV and DV qubits. The cover of Nature Photonics! Single-photon entanglement is one of the primary resources for quantum networks, including quantum repeater architectures. Such entanglement can be revealed with only local homodyne measurements through an entanglement witness the team proposed and demonstrated in collaboration with GAP-Geneva and CQT Singapore. In this study, we provided an extended analysis of this witness by introducing analytical bounds and by reporting measurements confirming its great robustness with regard to losses. Even with communication channel losses of around 95%, entanglement can still be experimentally witnessed, both in the symmetric and asymmetric loss cases. This study highlights the potential of optical hybrid methods, where discrete entanglement is characterized through continuous-variable measurements. This work was done in collaboration with GAP-Geneva, CQT Singapore and Basel University. Single-photon entangled states, i.e. states describing two optical paths sharing a single photon, constitute the simplest form of entanglement. Yet they provide a valuable resource in quantum information science. Specifically, they lie at the heart of quantum networks, as they can be used for quantum teleportation, swapped, and purified with linear optics. The main drawback of such entanglement is the difficulty in measuring it. In this context, we proposed and experimentally tested an entanglement witness allowing one to say whether a given state is path entangled and also that entanglement lies in the subspace, where the optical paths are each filled with one photon at most, i.e. refers to single-photon entanglement. It uses local homodyning only and relies on no assumption about the Hilbert space dimension of the measured system. This work provides a simple and trustworthy method for verifying the proper functioning of future quantum networks. An example of hybrid protocols where the toolboxes are efficiently combined! The characterization or subsequent use of propagating optical quantum state requires the knowledge of its precise temporal mode. Defining this mode structure very often relies on a detailed a priori knowledge of the used resources, when available, and can additionally call for an involved theoretical modeling. In contrast, we developed a practical method enabling to infer the optimal temporal mode directly from experimental data acquired via homodyne detection, without any assumptions on the state. The approach is based on a multimode analysis using eigenfunction expansion of the autocorrelation function. We illustrated this capability by experimental data from Fock states and Schrodinger cat-like state preparation. Using a continuous-wave type-II optical parametric oscillator below threshold, we have developed an efficient source of heralded single-photons with high-fidelity. The generated state is characterized by homodyne detection and exhibits a 79% fidelity with a single-photon Fock state (without correction for detection losses). At the output of the OPO, the single-photon heralding efficiency reaches 91%. The low admixture of vacuum and the well-defined spatiotemporal mode are critical requirements for their subsequent use in quantum information processing. The interaction of a quantum system with the environment leads to the so-called quantum decoherence. Beyond its fundamental significance, the understanding and the possible control of this dynamics in various scenarios is a key element for mastering quantum information processing. 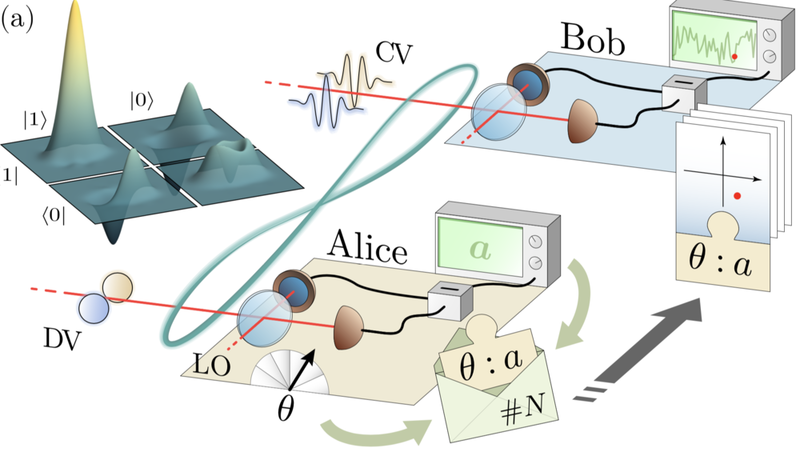 We reported in this work the quantitative probing of what can be called the quantum decoherence of detectors, a process reminiscent of the decoherence of quantum states in the presence of coupling with a reservoir. By implementing a quantum detector tomography, we demonstrated how the quantum features of two single-photon counters vanish under the influence of a noisy environment. We thereby experimentally witnessed the transition between the full-quantum operation of the measurement device to the "semi-classical regime", described by a positive Wigner function. The exact border between these two regimes has been explicitely determined and measured experimentally. An efficient technique for single-photon generation consists in preparing such states via a conditional measurement on photon-number correlated beams: the detection of a single-photon on one of the beam can herald the generation of a single-photon state on the other one. Such scheme strongly depends on the heralding detector properties, such as its quantum efficiency, noise or photon-number resolution ability. These parameters affect the preparation rate and the fidelity of the generated state. After reviewing the theoretical description of optical detectors and conditional measurements, and how both are here connected, we gave in this paper the effects of these properties and compare two kind of devices, a conventional on/off detector and a two-channel detector with photon-number resolution ability.